Demand – Room Nights Sold. All of the fears that have been endlessly rehashed these past few years — an uncertain economy, continuing high levels of unemployment, the election, the fiscal cliff, troubles in Europe — did not prevent business or leisure travelers from taking trips and staying at hotels. 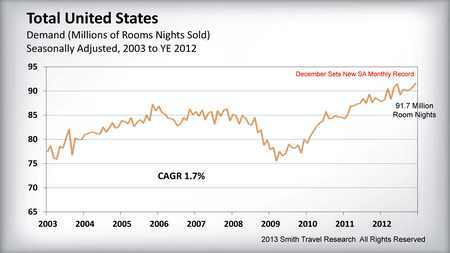 In fact – good news – hotel room demand for the 4th quarter of 2012 was quite robust, with December setting an all-time record. Occupancy. After the Great Recession, recovery in the hotel sector was led by occupancy growth at the expense of rate, as hoteliers sacrificed rate to fill their hotels. 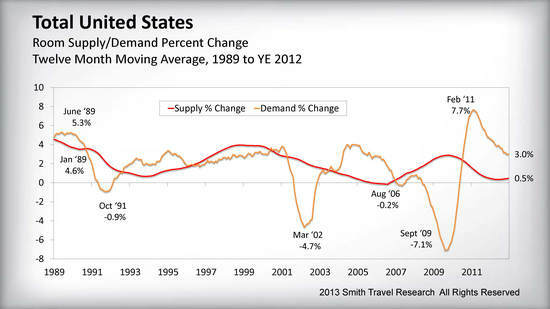 Although demand continues to set new records in absolute terms, the demand growth is slowing. Occupancy growth was 4.2% in 2011 but slowed to 2.4% in 2012. It is projected to dip to 1.8% in 2013 before kicking up a bit to 2.8 in 2014. Rate. Now the story is all about rate. 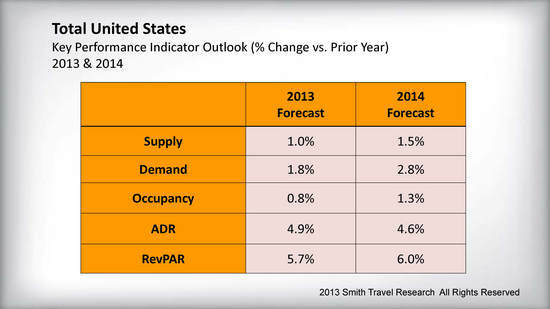 Rate growth in both 2011 and 2012 was 3.8% in the US, but is projected to grow at 4.9% in 2013 and 4.6% in 2014. RevPAR. Of course, RevPAR growth is the factor that computes the combined effect of occupancy rate and rate growth. Coming off the lows of the Great Recession, RevPAR grew at 8.2% and 6.3% respectively for 2011 and 2012. RevPAR is projected to grow at 5.7% and 6.0% for 2012 and 2014. To put this into perspective: until the past few years, RevPAR growth of 5-6% would have been at the high end of 30-year averages. These are healthy numbers. Supply. This is where the picture gets even better. The supply pipeline is now below the long-term average, and is expected to grow at 1.0% and 1.5% in 2013 and 2014. 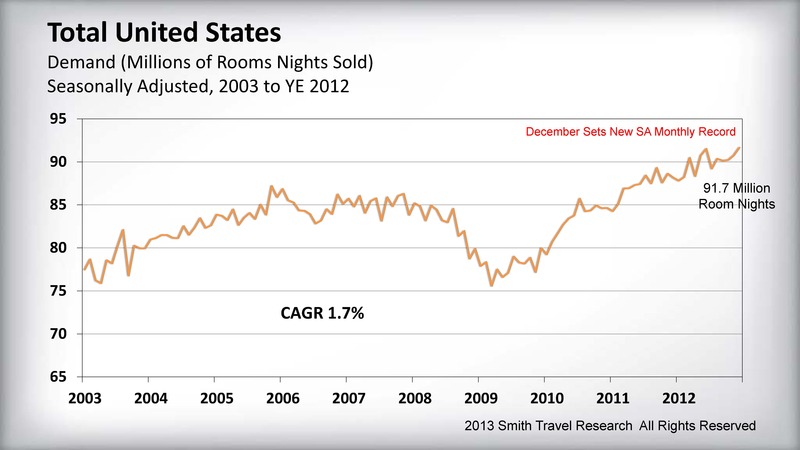 The hotel industry typically hurts itself, on a cyclical basis, building more hotel rooms when fundamentals are strong. 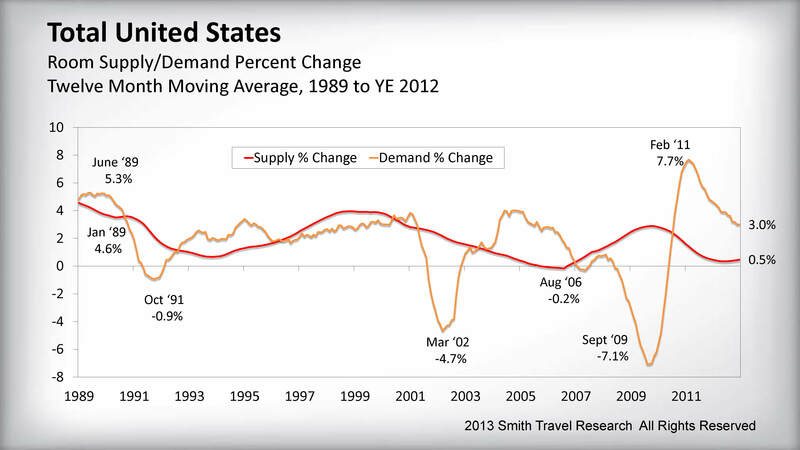 That did not happen this cycle, so we are not dealing with the negative effects of oversupply. This is one reason that fundamentals continue to look good through at least 2017. Our friends at Smith Travel Research (who provide the industry with data) recently shared with us their 2013 and 2014 forecast for the key performance indicators. Here is the forecast. JMBM’s Global Hospitality Group® is committed to the success of the hospitality industry and we are encouraged to see that the numbers bear out a solid recovery of the industry! We see a period of steady, continuing improvement over the next 5 years. We believe the robust recovery of 7 of the top 25 markets will spread to virtually all of them. The feeding frenzy to buy hotels in New York, San Francisco, Los Angeles, Miami and Boston will spread to other major urban areas, and even to secondary and tertiary markets as buyers look for value and find it. The exceptional improvement that has been enjoyed by the luxury and upper segments of the business will spread down the food chain. Hotels will be added to major regional malls and shopping centers over the next several years. Studies of current hotel-retail mixed-use projects have proven there are powerful competitive advantages for both the hotel and the retail components in these mixed-use settings. The retail sector has recovered sufficiently, and owners want to harvest the synergies of having a major hotel component in their malls. Many of them have the cash to do it and are moving forward with plans that have been shelved for the past few years. Hotel mixed-use projects are on the drawing board everywhere. These kind of projects are successful whether the other uses are retail, residential, office, sports, or entertainment. Mixed-use projects nationwide have proven this and hotel mixed-use developments will flourish when financing returns for construction. Generally, hotel development will be significantly constrained by lack of construction financing. Where it is appropriate, developers will use funds generated through the EB-5 Immigrant Investor Visa Program as part of the capital stack. 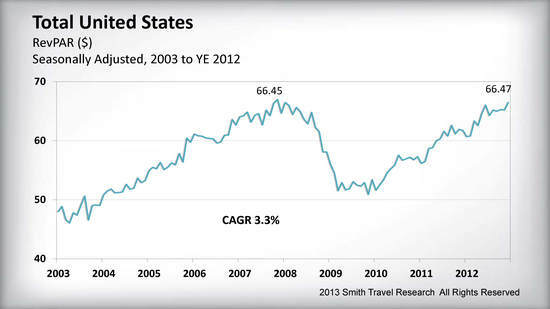 The hotel industry has stabilized and is in an environment that will steadily improve for the next 5 years. 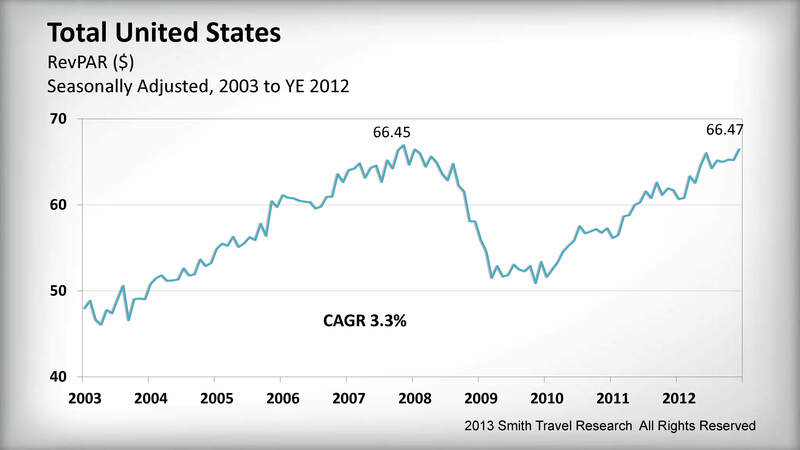 This is a very attractive scenario for investment and now is the time to buy a hotel! The hotel lawyers with JMBM’s Global Hospitality Group® can help you find the right team members to guide you through the complex process of a hotel acquisition. We can help evaluate the opportunity, identify the issues that affect the hotel’s value, resolve issues that hinder the transaction and close the deal. If you feel the timing is right for you to buy a hotel, you may want to check out our resources on that subject (see below).